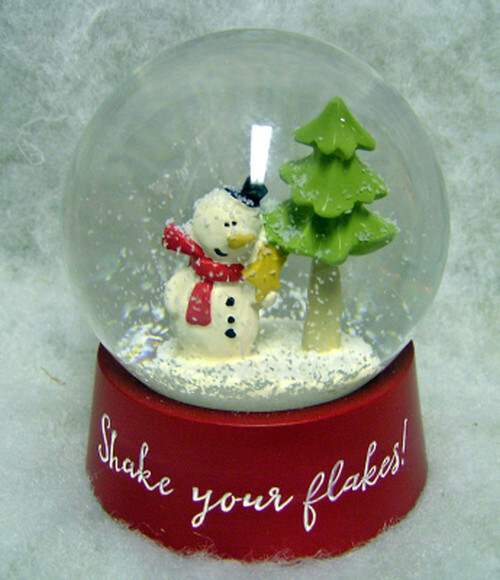 This unique snow globe says "Shake your flakes!" on the base. 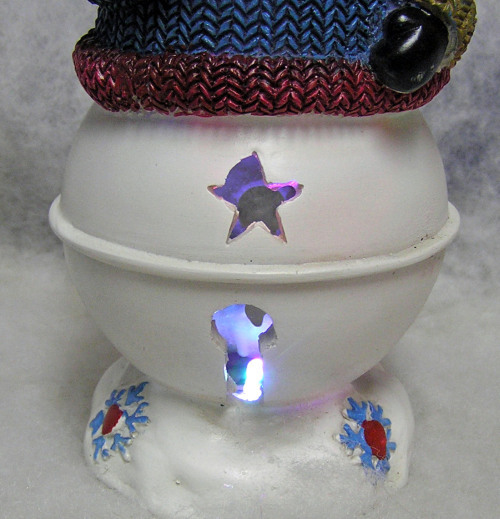 There is a snowman with top hat, scarf, and star along with a pine tree inside the globe. this measures 3 x 2 1/2 x 2 1/2. 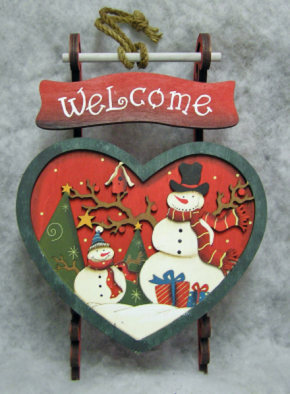 This unique wooden heart features cut out snowmen with scarves, trees, birds and birdhouse, presents, and stars. It has a separate wooden border and jute hanger. It can be personalized. This ceramic snowman head features a hat with pine cones and greens and a cardinal. 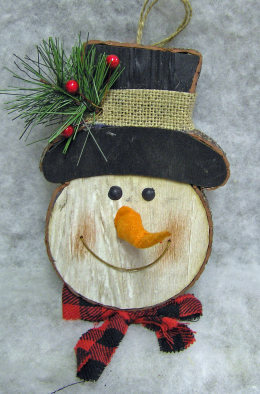 He has a carrot nose, rosy cheeks and a big smile. He can be personalized on his hat. It measures 4 1/2 x 4 x 2 1/2. These adorable ceramic snowmen lights come in two styles: Man Snowman and Woman Snowman. 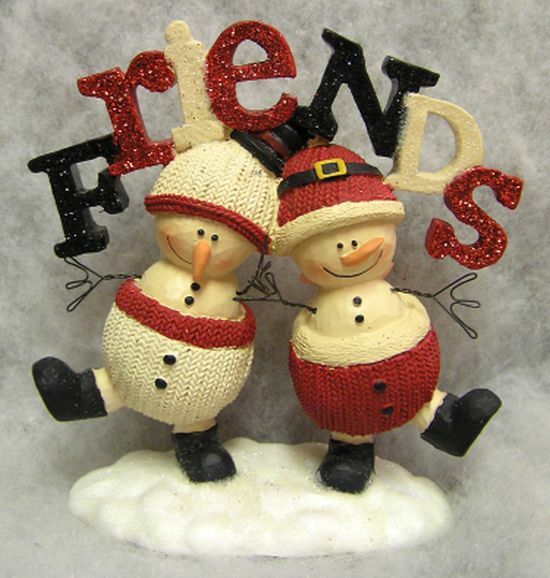 They have lots of details with knitted sweaters, scarfs, birds, carrot noses and cut outs. They have a battery operated light inside that turns red, blue and green and shines through the cut outs (click on photo to see the light). They measure 9 x 4 x 4. 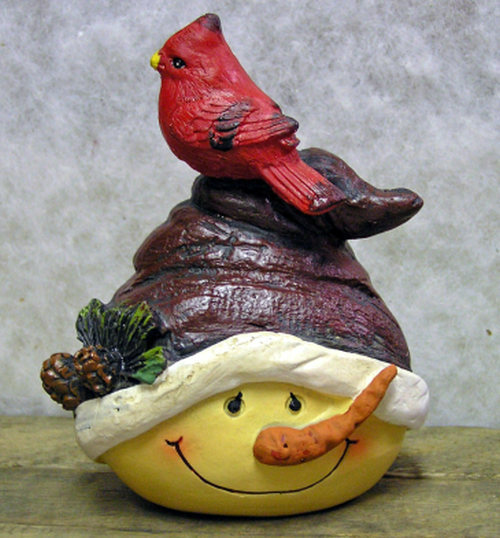 This unique snowman head features a large top hat with greens and berries on it. It comes in two styles: Plain/Personalized (shown) and "Let It Snow" (click on photo to see this option). 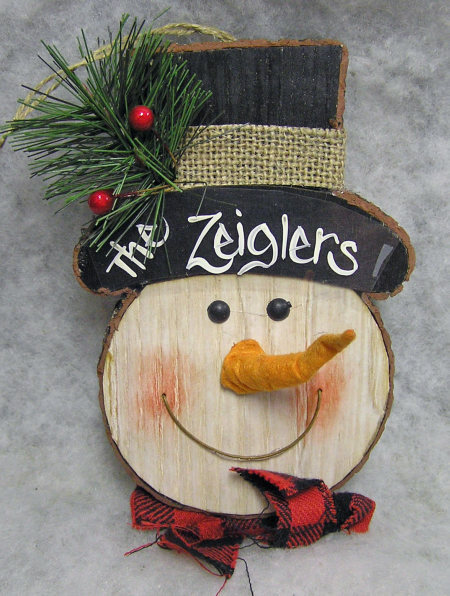 It has a separate nose that is screwed on, two screw eyes, rosy cheeks and a big smile. It measures 9 x 7 x 2 1/2. 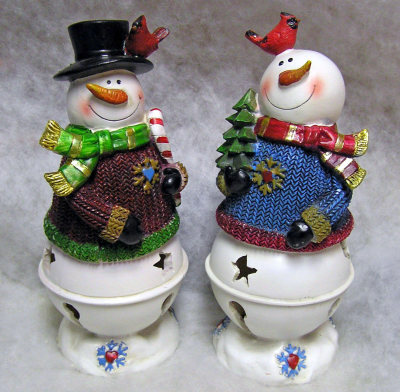 These melting resin snowmen come in two styles: Top Hat Snowman and Green Hat Snowman. The Top Hat one says "We all have an occasional meltdown." 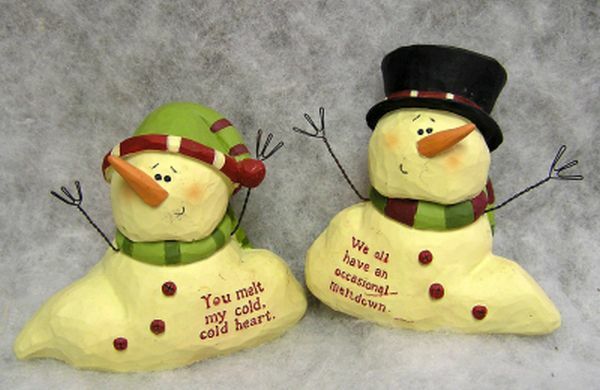 and the Green Hat one says "You melt my cold, cold heart." 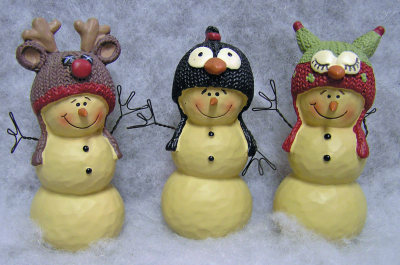 They have carrot noses, wire arms, cute little smiles, and scarves. They measure 3 1/2 x 3 1/2 x 2 1/2. This rustic wooden box is a Manchester Cottage original. It has three wooden snowman heads with fabric bows, 2 buttons, and the word "family" hand painted on the front. 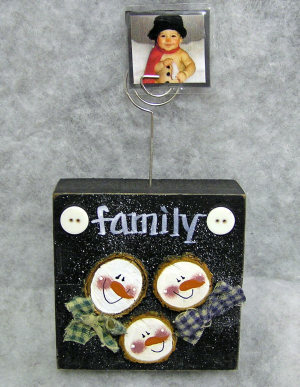 There is a curled metal stand at the top to hold photos, notes, or whatever you would like. It measures 7 x 4 x 1 1/2. 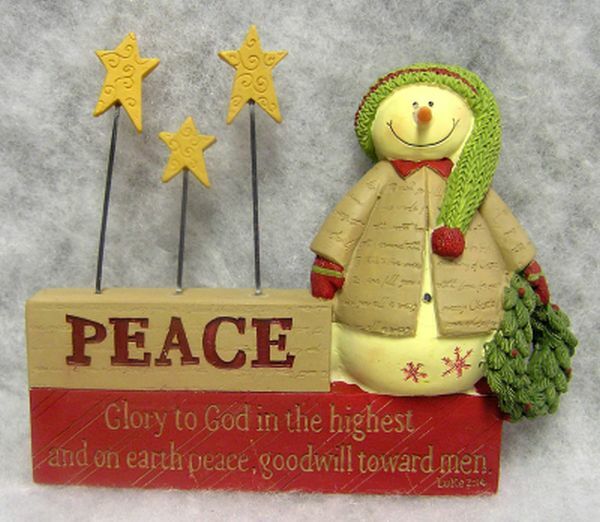 "Glory to God in the highest and on earth peace, good will toward men" is the verse on the bottom of this resin item. A snowman is sitting on the top and is holding a wreath, wearing a tan coat and has a knit look snow cap. It also says "PEACE" and has three stars on metal wires on the top. It measures 4 1/2 x 6 x 2. 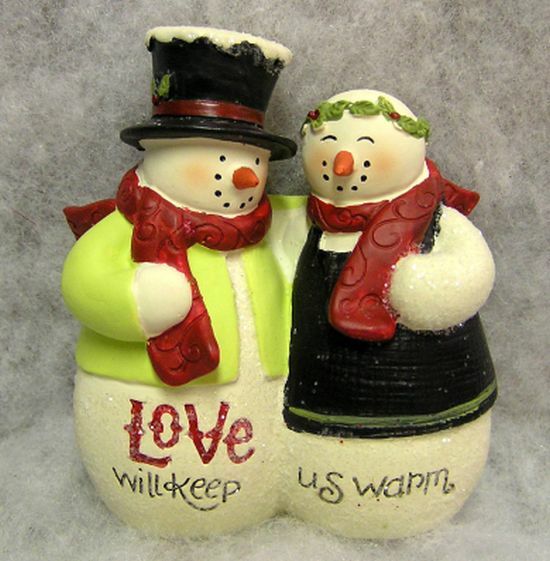 This resin couple has their arms around each other and it says "Love will keep us warm". 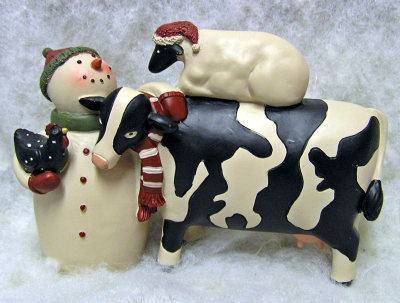 They have coats, scarves, and a glittery finish. They measures 3 1/2 x 3 x 1 1/2. 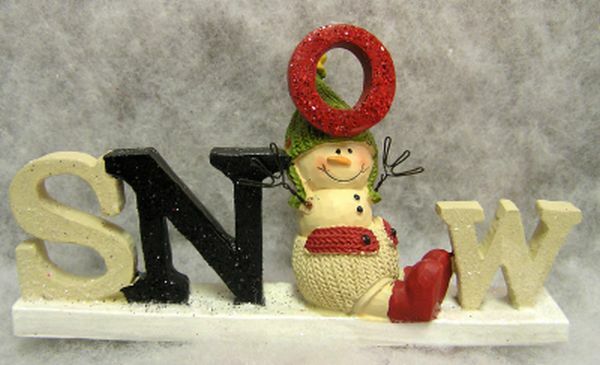 "S-N-O-W" is spelled out on this snowy base. A resin snowman with hat, shorts, and wire arms is holding the "O". It measures 3 x 5 1/2 x 1 1/2. 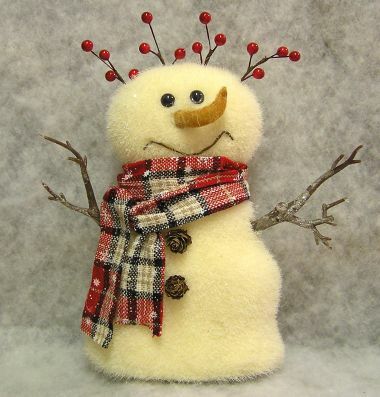 This fluffy snowman features berries on his head, twig arms, a plaid wool scarf, and little pine cone buttons. He has a carrot nose, button eyes, and a smile. He measures 10 x 10 x 4. Glittery letters spell out "FRIENDS" at the top of this resin item. 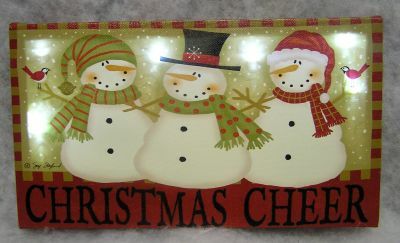 It has two snowmen with hats, shorts, wire arms, and boots. They are standing on a mound of snow. This measures 4 1/2 x 5 x 2.